The Center Moriches Fire Department was honored to participate in the 10th Anniversary 9-11 Memorial Service held at the firehouse Sunday evening September 11th. Hundreds of residents came to the firehouse on Main Street to pay tribute to those who lost their lives on that tragic day. The ceremony included remarks from local dignitaries, as well as performances of various music selections. Over 100 Fire and Emergency Services personnel from the surrounding area were on hand to pay tribute to those who paid the ultimate sacrifice. Emotions ran high as the Siol Na Heireann bagpipes, filled the air with the sounds of "Amazing Grace" in a solemn tribute to those who died. 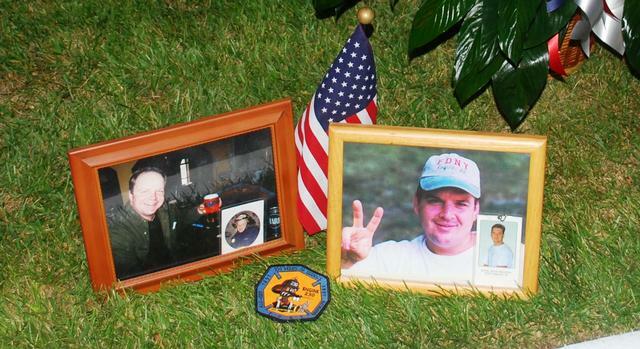 Probably the most tangible reminder of this solemn occasion was when the Center Moriches fire department unveiled a memorial that included a piece of steel from the World Trade Center. The WTC steel was provided by the Center Moriches School District who acquired the artifact earlier this year. In a joint venture, the Center Moriches Fire Department and the Center Moriches School District teamed up to provide the community of Center Moriches an area they can go to honor the extraordinary heroism, commitment and sacrifice of the 9-11 victims, rescuers and their families. 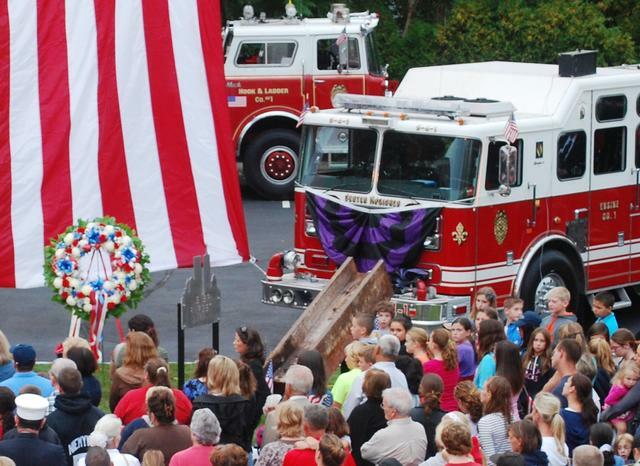 The 9-11 memorial will prominently display the 1,600-pound steel column at the Center Moriches Fire Department, and will serve to ensure that future generations will remember the sacrifices made on September 11, 2001. The September 11th anniversary has particular significance to the members of the Center Moriches FD as our own firefighters worked alongside FDNY firefighters at the World Trade Center site during the rescue efforts in 2001. After the ceremony, residents quietly walked up to touch the steel that once was part of those symbolic buildings and personally reflecting on their own thoughts. Our thoughts and prayers will always remain with our fallen FDNY brothers and all of the families that lost love ones that fateful day. Center Moriches Fire Department Probationary Firefighter Maria Warner singing "God Bless America"
Ex Captain Mike Whelan Strikes The Four Fives … A tradition where five bell strikes, repeated in four series, with a slight pause between each series. This symbolizes the rendering of final honors to departed comrades. This is known in the fire service as "STRIKING THE FOUR FIVES". The Siol Na Heireann bagpipes, filled the air with the sounds of "Amazing Grace" in a solemn tribute to those who died.